Hi friend! I hope you’ve had a fabulous long weekend! I’m currently writing this on the porch of my friend’s amazing cottage on the North Channel of Lake Huron. To say I am feeling blissed out and in paradise would be the understatement of the year. We’ve been boating, tubing, water skiing, cliff jumping, bon firing, sailing, farmer’s marketing, ping ponging, poker playing, cooking, and eating like crazy. As I type this another friend is smoking pork shoulder and making his own bbq sauce. I’ve been drooling all afternoon. Anyhoo, despite all the blissfulness I wanted to take advantage of a quiet moment to share another recipe with you! Since I’ve been traveling so much this summer these granola bars have been saving my life on long flights and travel days. Plus they are ridiculously easy to make! 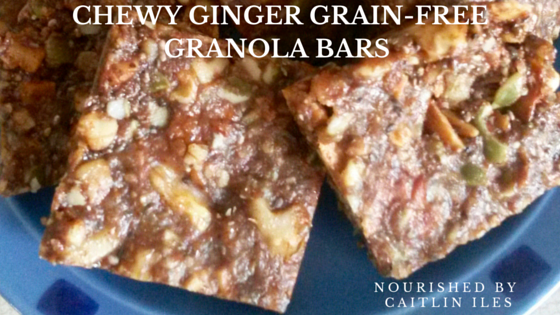 I’ve made a similar version before, but these ones are souped up with a tangy zing of crystallized ginger! You can make these bars in under 5 minutes, which makes them a perfect go-to snack for people who are super busy. Make a big batch and then store them in the freezer to grab and go whenever you need a blood-sugar balancing snack. The nuts and seeds are a great source of healthy fats, fibre, and protein which ensures that, so long as you eat them in moderation, these bars won’t cause the dreaded spike and crash of blood sugar that leads to crankiness, cravings, and exhaustion. So without further ado, let’s get cooking! Grease a 9×9 square baking pan with coconut oil. Set aside. In a food processor combine all nuts, seeds, coconut shreds, and ginger pieces until roughly chopped. It doesn’t need to be very fine. Set aside. In a medium saucepan over low heat melt the almond butter, honey, and vanilla. Stir until thoroughly combined. Once melted pour nut mixture into the liquid and stir until thoroughly combined. Put a bit of coconut oil on your hands and spread the mixture evenly within the baking pan. Place baking pan in the freezer until bars are set. About 30 to 60 minutes depending on your freezer. Well that’s our recipe for today! I’m off to boat over to the tennis court for a pre-dinner game (though if I’m being honest I’m going to watch for a few minutes then go swim… I’m not so much with the racquet sports). And don’t forget to sign up for my mailing list to make sure you never miss a new recipe! You can register by clicking here and receive a free Sensational Summer Smoothies E-Book as a thank you. These are really good!! Added to my favourite snacks list. Thanks for posting! I put the ginger into the food processor “at the top” so it didn’t get ground up enough for me and thoroughly distributed when I pulsed the mixture. I’ll put it in at the bottom next time. They also get a bit greasy for me at room temp (very nice chilled though) so I’ll try to scoop around oils in my nut butter next time and see if that makes a difference. Thanks again! Thanks for the feedback! Sometimes depending on the but butter brand/type they can be more or less… squishy at room temp, so scooping around the oil is a great call! You can also add in a little more flax or chia to help bind them and absorb the oils 🙂 Enjoy!